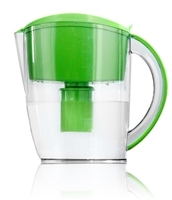 Affordable way to experience alkaline water without spending thousands. No clutter or installation required like counter top or under counter water ionizers. Portable for the office and travel. Built around the same natural alkaline process used in all Vitev products, just in a smaller, sleeker package. Simply fill the top reservoir with water from your faucet and the water will flow through a combination carbon filter and mineral cartridge to fill the pitcher with fresh, clean, mineral rich alkaline water.